Beat cream cheese, sugar and whipped cream in a large bowl with a mixer until creamy. Stir in strawberries and wafers/biscuits. Spread stretch film over the cups and pour the cream into the film covered cups. Cover the tops and freeze for about 6-8 hours or until firm. Remove desert from the freezer and turn upside down the cups over small desert plates. Serve after 15 minutes before melting. You can top with remaining strawberries and basil/mint leaves. Krem peynir, seker ve krem santiyi mikser ile buyuk bir kapta cirpin. Krema seklinde butun malzemeler butunlestikten sonra cilek ve biskuvileri (istege bagli) ilave edin. Kasikla karistirin. Parfe ya da herhangi kucuk kaselerin icine strec film yayin ve parfeyi icine dokerek uzerini duzlestirin. Uzerlerini strec film ile kapatin ve buzlukta yaklasik 6-8 saat ya da sertlesene dek bekletin. Servid yapmadan 15 dakika once parfeleri buzluktan cikarin. Kaplarini ters cevirerek parfeleri tatli tabaklarina yerlestirin. Geri kalan cilek dilimleri ve taze nane yapraklari ile susleyerek erimeden servis yapin. Strawberry...... I just love strawberry. 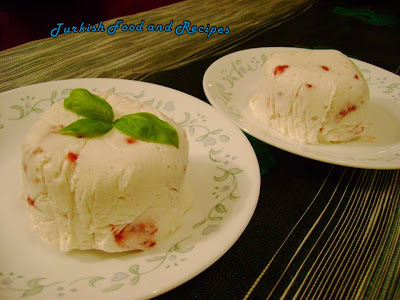 This article have a very good and healthy dish of strawberry.